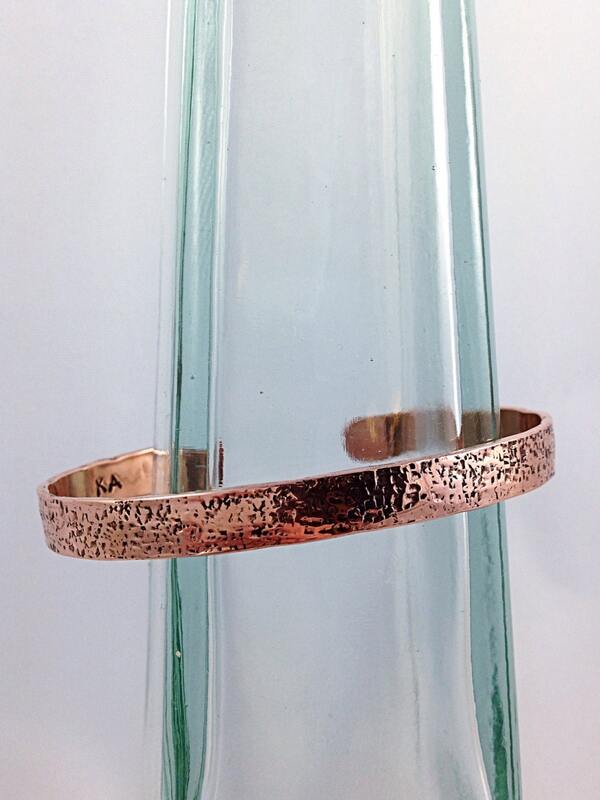 Simple and attractive rustic hand wrought copper cuff bracelet. Hammer wrought "Textile" texture gives the elegant look of woven fabric or raw silk. Rich hammered texture unique to each one. Looks fantastic by itself or layered with other bracelets (shown in last two photos). 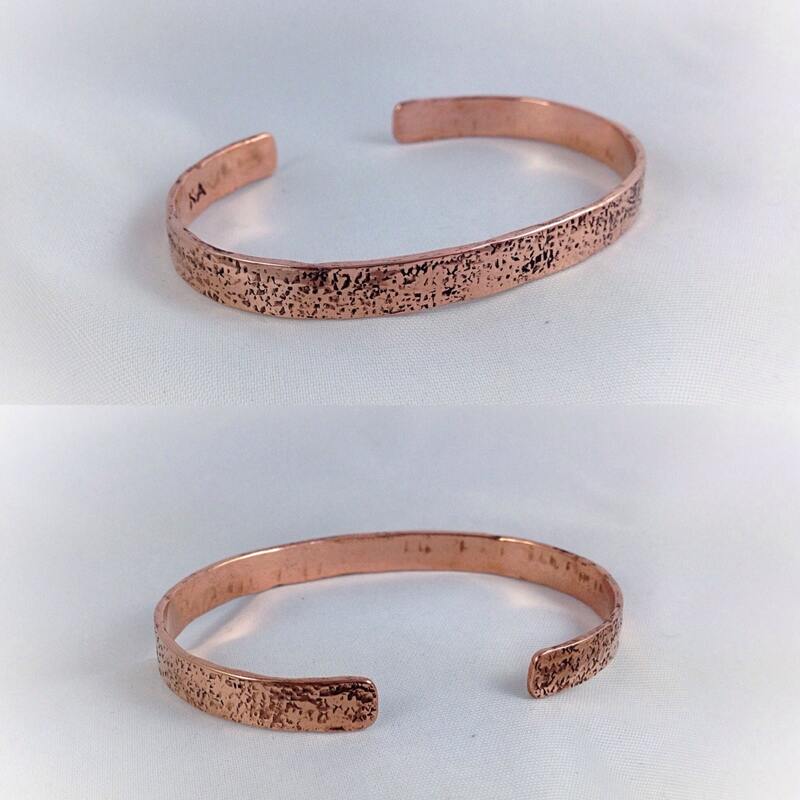 This design is a heavy gauge copper that looks great on men or women. Custom sized per your wrist measurement, simply select your wrist size from the drop menu. **PLEASE NOTE** read below for wrist measuring guide and message me if you have any questions at all. 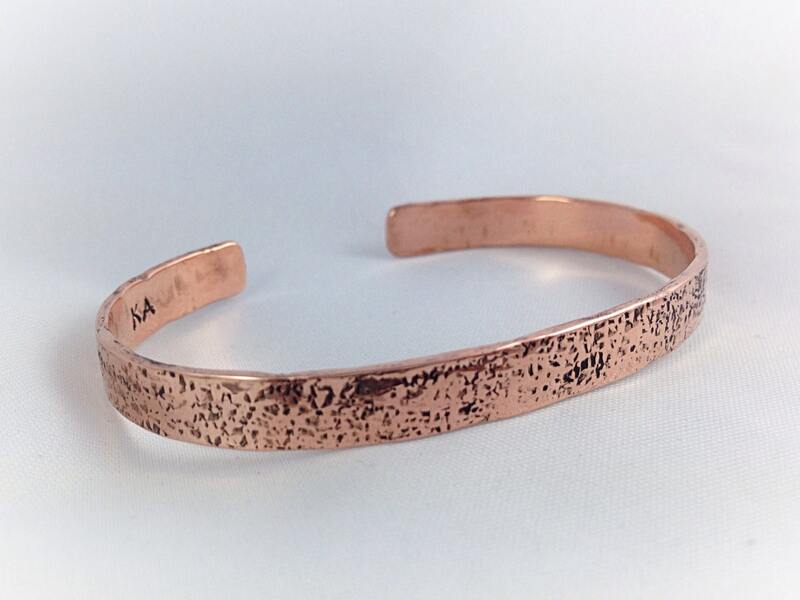 This bracelet is a heavier gauge than my standard hammered copper bracelet. I start with solid 6 gauge copper wire which gets hammer formed and shaped completely by hand into a cuff with it's own unique rustic texture, no two are ever the same. After the hammer forming, it gets meticulously refined, filed and polished by hand, to ensure that it is absolutely comfortable to wear. 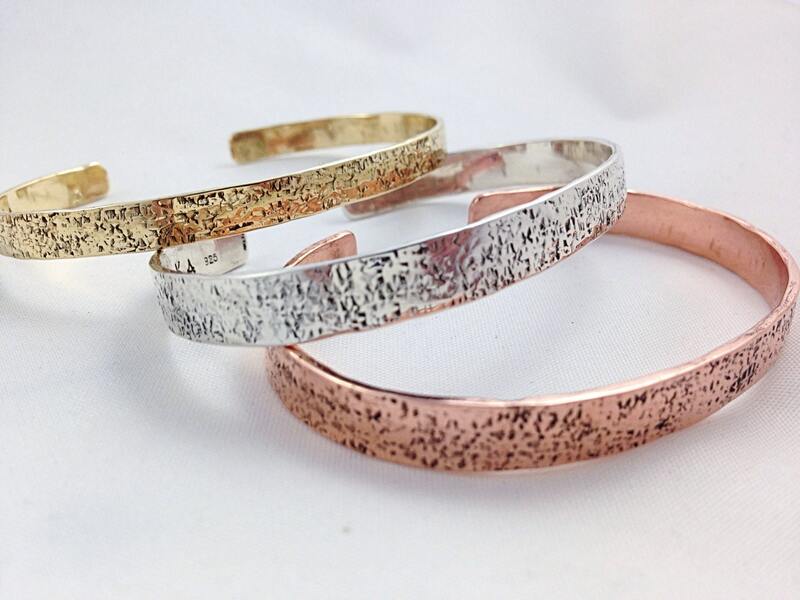 This design is made to your custom length and is approximately 7mm to 8mm wide top to bottom and 2mm cuff thickness. *Please note* My copper jewelry is made of solid copper which will darken and patina over time. These pieces are polished but not lacquered, which makes them easy to clean but means they will darken more quickly. For some wearers, copper will leave a temporary green mark on your skin. It washes off with soap and water, and is harmless. 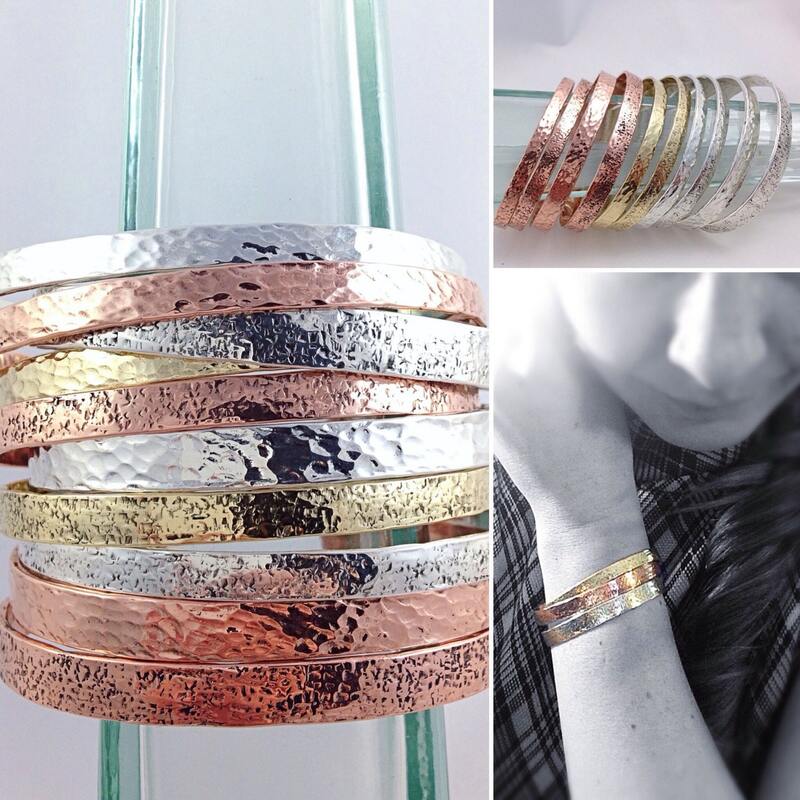 If you have any questions about caring for copper or wearing copper, please feel free to message me before purchase. If you don't know your wrist measurement, here's how to measure to get the proper size. Take a flexible tape measure and measure around the part of your wrist where you want the bracelet to sit. The tape measure should be snug against your skin (no gap between the tape measure and your wrist) but not so tight that it squeezes your wrist. the measurement where the two ends meet is your wrist measurement. If you don't have a tape measure handy, you can use a string and a flat ruler. Simply place the string around your wrist in the same way as you would with a tape measure. Pinch the string on each end where the two ends meet, and then place that section of string against a flat ruler to get your measurement. That's it! Then choose your wrist measurement from the drop down menu and I will size your bracelet accordingly. If you have any questions at all about sizing, or you don't see your size listed in the drop menu, please message me. I'm happy to help!